JIPMER MBBS Application Form 2019: Jawaharlal Institute of Postgraduate Medical Education and Research, Puducherry is known as JIPMER. JIPMER Conducts Entrance exam for providing Admission into MBBS Courses. The Entrance exam will be conducted for almost 200 seats in JIPMER Karaikal & Puducherry. The Application form is the first step toward the Exam and admission. The JIPMER Application form will be available through online mode only. It will be available in the month of March 2019. 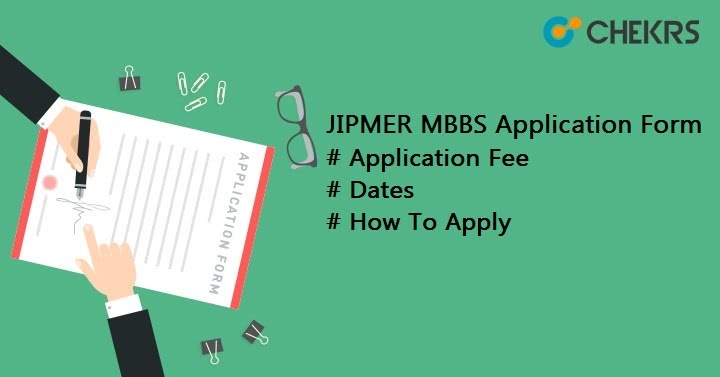 In this article, we will provide all the details of Application Form, Dates, JIPMER MBBS Application Fee and How to Apply for JIPMER MBBS 2019. JIPMER MBBS 2019 Schedule will be announced with the official notification. The Application Form will be available online in the month of March. It will be Available till the 2nd week of April. To Fill the JIPMER 2019 Application Form Candidates must have to be eligible for it. Candidates can check their eligibility using the JIPMER 2019 Eligibility Criteria. An Indian, as well as Overseas Citizen of India, is eligible for the JIPMER 2019. Candidates must be completed the minimum age of 17 years on or before 31.12.2019. There is No upper age limit to Apply for JIPMER 2019 Application Form. Candidate must have qualified the 10+2 or equivalent examination with Physics, Chemistry, Biology/Biotechnology along with English and one elective subject. Candidates must obtain minimum 50% marks in aggregate in 12th class. OBC/SC/ST/OPH candidates need 40% marks and the GEN-OPH candidate will require 45% marks in 12th PCB stream. Appearing Candidates are also eligible to apply for JIPMER 2019 Application Form. Mode Of Payment Online; Through net banking, debit/credit card, UPI, and E-wallet. Candidates need to follow these steps very carefully. We have already explained the steps below. First of All open the Official Website. Find and click on ‘Apply Online for JIPMER MBBS Entrance Examination 2019’. Read all the instructions under How to Apply JIPMER MBBS 2019. On the next page, Fill all the details like mobile number, DOB and email Id and click on ‘Register’. You will receive notification on Mobile Number and E-Mail. Either click on Application form link on the official website or follow the link you received on the official website. Login on the site with the information like User ID and Password. After logging in, the Application form will be there. In which fill all the details like Address, Qualification, Contact Details and other details. After filling all the asked details upload the images in the prescribed format and upload it to the relevant place. After filling the entire form move to the payment page. Here you have to pay the JIPMER MBBS Application Fee. Application fee details are given above. Pay the fee through the available online mode. After successful payment, take a print-out of Confirmation Page. Also, take print out of Payment receipt and filled Application. After Filling all the forms and reviewing them Finally, Submit your Application Form.